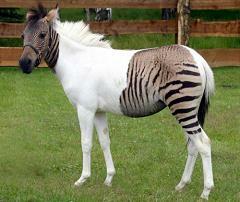 What Happens When You Cross a Zebra and a Horse and What are the Offspring Called? Zebras and Horses can indeed mate and produce offspring, and they do this regularly. And Zebras can mate not just with horses, but with donkeys as well. Zebras and horses are crossbred, usually a zebra stallion with a horse mare, not just for curiosity’s sake but because they also make good pack animals. They’re usually called a zorse, zebroid, or more romantically, golden zebra. The names used for donkey/zebra offspring are zebrass and zo-donk; for pony/zebras, zony or zeony. Horse enthusiasts who breed zebra mixes would ultimately like to see these mixes allowed into the horse breeders’ showring. Although the offspring are smaller than horses, they could easily fit into the donkey and pony categories. Zebras have a checkered and striped past. What Happens When Lions and Tigers Mate and What are the Hybrid Cross-Bred Offspring Called? Where does the term “criss-cross” come from and What does criss-cross mean?